The UK coalition government yesterday announced its spending plans for the next four financial years (to 2014-15). These spending plans are subject to scrutiny and approval by Parliament, though the tradition in Britain is that the spending plans are usually approved without significant amendment. Overall, this spending review is a seismic political event, which will be talked about for many years to come. It will reduce planned spending by £81 billion ($130 billion) a year, and remove about half a million public sector workers from the government payroll. I can also confirm that this Coalition Government will be the first British government in history, and the first major country in the world, to honour the United Nations commitment on international aid. The Department for International Development’s budget will rise to £11.5 billion over the next four years. Overseas development will reach 0.7% of national income in 2013. This will halve the number of deaths caused by malaria. It will save the lives of 50,000 women in pregnancy and 250,000 newborn babies. Whether working behind the counter of a charity shop, or volunteering abroad, or contributing taxes to our aid budget, Britons can hold their heads up high and say – even in these difficult times, we will honour the promise we make to the very poorest in our world. 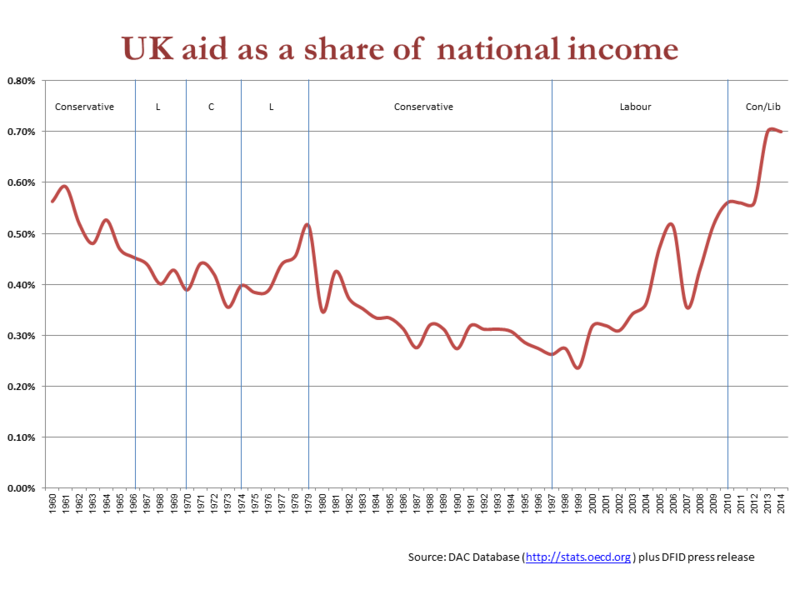 The chart below, which shows aid as a share of national income since 1960, shows that this really is historic. Britain will, for the first time, meet the international aid target of 0.7% of national income, joining Denmark, the Netherlands, Norway and Sweden. In cash terms, Britain’s official development assistance (ODA) will increase by 50% over the four years to 2014. Most of this will continue, as now, to be channelled through the UK Department for International Development (DFID), whose budget will increase by 47% in cash terms (37% after taking account of inflation). The increase will occur mainly in 2013, when British aid will increase by a third from £9.1bn to £12.0 bn. To get a sense of the political priority that development has been given in this spending review, consider that the National Health Service will increase by just 1.3% in real terms over the same four years; and many government departments face reductions of 20% to 30%. This is a considerable act of political bravery on the part of the Conservative-Liberal coalition. Today’s Daily Express (see right) is among the British newspapers demanding that, in the context of a spending review in which many public services face declining budgets, aid should be cut too. A significant reduction in the admin budget. Running costs (a definition of back-office costs used by the OECD DAC) will be reduced to 2% of total spending by 2015, half the global donor average of 4%. A new Independent Commission for Aid Impact will assess all ODA spending to ensure best value for money and effectiveness. DFID will end bilateral aid to China and Russia. Of course, the development experts have quibbles and concerns, such as whether aid will be spent disproportionately in support of Britain’s security priorities, and how DFID will manage a fast rising aid budget while staff numbers are being reduced. These are, in my view, reasonable questions to ask; and I will be among those continuing to ask questions about whether and how aid spending can be used most effectively; but it seems churlish today to focus on these issues rather than the big picture of a substantial demonstration of political and financial commitment to overseas aid. The coalition government should be congratulated for their commitment to the UK’s overseas aid programme, and for their efforts to improve the transparency, accountability and effectiveness of aid to have the maximum possible impact improving the lives of people in developing countries. Remarkable. Owen rightly points to the likely problem of DfID being able to spend the bigger budget effectively and without ‘slippage’, indeed that would have been the case even if the Department was not subject to pressures on the administrative budget. A risk is temptation to offload more cash onto the multilaterals (including the notoriously ineffective EC) in order to maintain spending targets. But it’s difficult to see how this can be avoided if DfID staff are to be reduced. That’s good news on almost all fronts. It’s just a pity that they’ve bought into one of the most pernicious development fallacies – the myth of low overheads. Development work is usually difficult work, and done better by people who have time to devote to it. In my experience most aid agencies are understaffed and over busy – which is a real impediment to the type of careful context-specific work that is most likely to work. Like Michael says, there’s a good chance much of the increased budget will simply be offloaded to multi-lats, or spent on low maintenance modalities like budget support. Neither of these are necessarily bad things, but it would be nice of such decisions were made based on their merits, and not an urgent need to get cash out the door. In most circumstances, increasing the aid budget and seeking to improve its effectiveness would both be great things. But at a time when the UK is facing massive public sector cuts, is this really the right thing to be doing? I would be surprised if the government followed through on this. Are they really going to increase the aid budget by £3 billion in 2013, when the public sector cuts are beginning to bite? My bet is they will set up the independent commission, then – in a couple of year’s time – they’ll see there are some problems with aid quality that need to be addressed, then they’ll backtrack on the pledge to increase aid even further. We can’t see the problem here. It’s easy to hit the 0.7% target: simply pump more cash into budget support. OK, a fair amount of that cash will be transferred to bank accounts in London and Zurich in fairly smart order but there’s no way of monitoring that. Or to put it another way, the beneficiary governments will ensure the UK gets the M&W information it needs to keep its auditors and parliamentarians happy. Job done! 0.7% in the end when reached will be champagne popping on the donor’s aide and not necessarily the recipient’s side. Going for reuslts is good (it’s not a unique project–definitely not by DFD. Consider the World Bank’s African Results Management System (ARMS) for example). But does that mean development–will that translate into East Asian style economies inthe long run? Its about time ALL our overseas committments are cancelled as we can no longer afford this. India and China should take this over as the fastes growing economies in the world today. We ard sinking into the abyss of a third world dicatatorship where overseas spending is put ahead of our own spending on Education, Welfare, Police, Roads and domestic spending thru out the UK. Sick Goverments we are electing now. Its time for the people to dictate to a gov rather than a gov dictating to its people. Owen replies: Joshua, thanks. The government was elected on a specific manifesto promise to increase aid to 0.7% of GDP by 2013. This is what the people voted for (and rightly, in my view.) I don’t think you can describe this as the government dictating to the people. Joshua, you should be thankful Mitchell and Co are cancelling aid to China while the World Bank (which DFID still funds) is not. Aid has always been part of any government strategy. in the 1990s, aid was still spent but for evne more non developmental purposes (the Pergau Dam incident). Where was your reaction then? First of all, I am not arguing for a reduction in 0.7. But I do have serious concerns about the ‘aid industry’ that has grown around the increased funding. I previously worked for a large bi lateral donor and then for an INGO. For various reasons I returned to my original profession and am now working as a solicitor doing legally aided asylum and immigration work. The contrast in the 2 sectors is astonishing. I now have to work at a much quicker rate, very long hours and the pay is much lower. I have a fraction of the time to prepare an asylum appeal compared with weeks or months on a policy paper I had at said bi lateral. And often the stuff I wrote at bi lateral and INGO was never read or I’d hear a couple of years later that someone else was ‘thinking around’ or writing an almost identical paper. So, maybe my development papers were rubbish and thats why nothing ever happened to them. It might also be said that a development policy paper (potentially) has an impact on whole communities wheras as asylum appeal on only one person or one family justifying hugely different resourcing. When I compare a day/ week/ year in my old life (or many frends current lives) with a day/week/year in my current life I feel a frustration that the dev’t industry seems to have lost touch with reality. Nowadays I simply don’t have time for retreats, seminars, round tables, blue sky thinking. Maybe we lawyers would do a better job if we did or maybe we are not a cerebral profession in the same way. As I said at the start, I am not aruging against 0.7. But the dev’t industry needs to take a long hard look at its own vested interests and who is benefiting from the substantial funding. I basically agree with J’s post – and have had a similar experience. I agree with increased aid (though maybe not now) and am passionate about reducing global poverty. But I too used to work for a bilateral donor and for an international NGO. I got tired of policy papers, seminars, roundtables, commissions, etc, etc. Personally, I got bored and so left to work in another profession. There are lots of committed and hard working people in the aid industry. But there are also a lot of vested interests (as there are in all organisations / industries), there’s a lot of UK people working overseas and being paid a lot of money (both working for bilaterals and multilaterals), there is very little accountable, there are a lot of people doing not a lot and a lot of aid money is spent on administration and staff costs. The contrast with other jobs in the UK (both public and private sector) is, in my own experience, startling.